Given the sensitivities involved, it was kind of miraculous that China last year allowed the mummies to travel to the United States as part of a three-museum exhibition tour. For years, foreign researchers were strictly forbidden from taking even tissue samples from the mummies out of China, and the mummies remained closely guarded until Victor Mair smuggled some tissue out of China in the 1990s when an unnamed Chinese researcher slipped him a sample during one of Professor Mair’s visits to Urumqi. That was then, this is now and the mummies were exhibited (more or less) without incident in California and Texas. Now comes word that Chinese government representatives have requested that many of the artifacts, including the mummies, be pulled from the tour’s last stop at the University of Pennsylvania Museum of Archaeology and Anthropology. The exact reasons are unclear, and attempts by the New York Times and AP to get a clarification from a Chinese Embassy in the midst of celebrating the Lunar New Year proved unsuccessful. 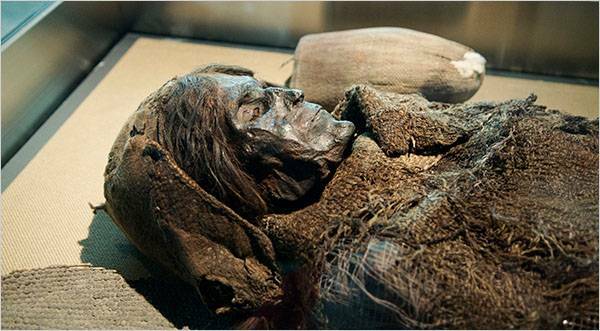 Victor Mair is, of course, a longtime professor at Penn, and no doubt worked hard to bring the mummies to the university museum. One wonders though whether this sudden change of heart on the part of Chinese officials has less to do with the University of Pennsylvania than it does with Professor Mair and his research. I am, very much however, speculating. I can understand why the Chinese government can be squirrelly about anything Xinjiang, but, for what it’s worth, Xinjiang is a part of China. I’m not sure there are too many people who dispute that. The real battle, however, is not over the current status of Xinjiang, but rather a testy and sometimes nasty struggle over who controls the history of a region with a complicated and tangled past. First of all, while the mummies are certainly not Han, neither are they “Caucasian” in the sense of “Western European,” nor are they necessarily the direct descendants of the group who identifies today as “Uighur.” As one might imagine in a land where the cultures of Eurasia met, pushed, traded, mated, and fought, ethnicity in Xinjiang is far from being a historically fixed signifier. Who is a “Uighur” has less to do with who was a “Uighur” than many people — and most Uighurs — might be comfortable exploring in detail. That said, the process by which Xinjiang became “provincialized” (to borrow a phrase) is a story fraught with historical traps for the Chinese government and its narrative strategy of “Unity Über Alles.” The Chinese government utterly rejects the idea that Xinjiang was ‘settled’ (never mind ‘conquered’ or ‘colonized’). The preferred story is one of spontaneous unity spread out over several thousand years. It’s a ridiculously (and unnecessarily) convoluted tale, and it’s also one that does little to promote the type of multicultural unity the Chinese government supposedly espouses. Denying a group of people their history, and forcing them to accept the history of the victors, only leads to the sort of misunderstanding, mistrust, and misrule which characterize Beijing’s relationship with the people of China’s Western Regions. By way of example, teaching schoolchildren in the United States that white settlers and the US Army perpetrated one of the bloodiest land grabs in global history is not the same as saying we should grant Arizona unconditional independence. (Though, at times, if wishing only made it so…) What it does do is remind those groups in our society which over the long term benefited from the unequal, exploitative, and, yes, even violent relationship with other peoples in our country’s history, that we have an obligation to respect those alternative pasts and other perspectives and to remember that the wrongs of the past are still with us, wrongs which we may never be able to fully redress. Now, it is entirely possible that last night as millions of Chinese watched the Spring Festival Gala complete with happy, singing, dancing, colorfully-dressed minorities consciously and deliberately presented as backwards and non-threatening simpletons, that a few people sat around and wondered, “Why is that?” or “That’s pretty f—–d up.” Hopefully that number grows, but until children start to learn about the other history of China, the many possible pasts that went into the building of the nation today, then minstrel pageantry and bad history will never give way to true understanding.